Figs were an undiscovered land for me before I moved to Turkey. Now I'm just longing for summer just to get some fresh figs in our Saturday street market... Ok, ok ... I'll tell you the truth, I don't go to the street market as it is still exotic for me because of all these shoutings screamings... However, I take the advantage of my neighbourhood supermarkets and their great variety of fruit. Last week I was missing LT so much that I needed something to remind me of it. I needed some spirit of Christmas and what kind of Christmas without cinammon. Let it be Christmas all year round... Figs with cinammon!!! 1. 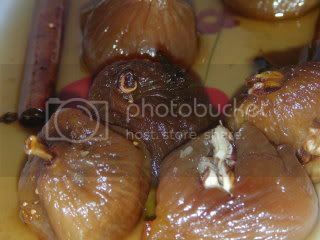 Wash the figs in boiled water. 2. Pour new water over the figs. Let it boil for 5 min. 3. Add sugar, cinammon and cloves. Simmer for 3 min until syrup thickens a bit. 4. Place the figs onto the plate, cut one side and stuff it with a nut. 5. Enjoy!!! NB: It's really sweet, so you can use less sugar or eat it with icecream, i.e. take vanilla ice-cream and pour the figs with cold syrup over it. Ko gero tikrai labai labai saldu.... Bet cinamonas puikiai dera su figomis.